A grill basket full of chopped vegetables roasting on the barbecue. These were beyond delicious. I’m a pretty half-hearted carnivore. Sure, I like the occasional steak (cooked to well done), and I quite like kebabs, satay, souvlaki, shawarma, donair, gyro, and all manner of marinated chicken breasts, especially cooked on a grill. And chicken tikka? Don’t even get me started. But I don’t need meat every day of my life. I lived many years as a vegetarian, and I learned to love the options available when you take meat out of the equation. If you like Indian food, vegetarianism is easy. Mostly, you just have to be creative – not as easy as you’d think, considering most cooks in Canada and the States consider creativity in the kitchen to mean dunking your cooked-from-frozen chicken nuggets in a jar of plum sauce instead of ketchup. As much as I’m not a die-hard meat lover, I’ve got a terrible weakness for barbecue cookery. The taste of flame-grilled food makes me weak in the knees. The smell alone is enough to send me into salivation land. So why do some vegetarians shy away from the barbecue? 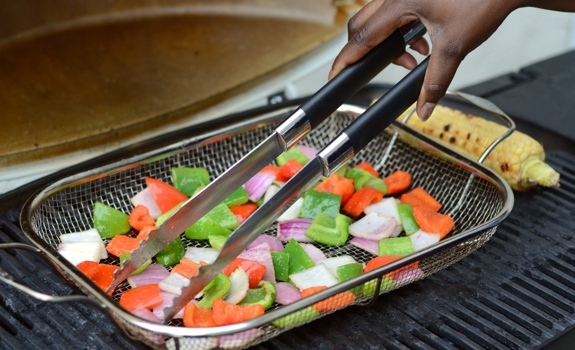 The way I see it, a barbecue can help add some creative spice to your vegetarian cooking. Flame grilling brings out the best not just in meat, but in all sorts of veggies, too. Grilled peppers and onions: Chop up some peppers and red onions into large chunks (no smaller than a square inch), toss them with some olive oil, salt and freshly crushed garlic, then let them sit in a bowl for about 20 minutes. Cook them in a grill basket, flipping regularly until they’re well roasted. The natural sweetness of the peppers comes out swinging; even if you’re a meat eater, whip this up as a side. Soooo good. 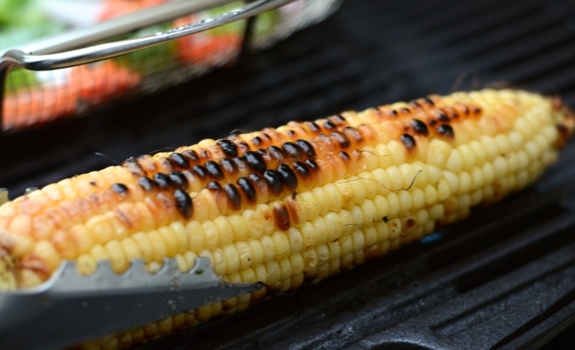 Corn: When I lived in Africa, grilled corn on the cob was a common street food. Grill it, butter it, and fall in love. Asparagus: The fresher the better. Toss prepped spears in a light coating of oil, sprinkle with salt, and throw them on the grill until they turn bright green. I’ve only tried this a couple of times, so I haven’t got the doneness part down to a science yet. Serve them with some garlic butter or drizzle on some decent balsamic. A few spears with supper is plenty. Paneer kebabs: If you’re a vegetarian, you surely know what paneer is. Cut fresh paneer into cubes, marinate it (the longer the better), thread it on a skewer with peppers and onions, and throw it on the grill. Look out, though. They stick to the grill, and may require a scrape from the flipper, not just a turn of the tongs. I think I’m going to get one of those two-sided flipping grill baskets before I try these again. Naan bread: The high heat of the grill works wonders on good homemade naan. Here’s the base recipe that I work from. Not particularly hard to make, but well worth the effort. Pizza: Unknown territory for me, but some folks swear by grilling pizza. And pizza, of course, is as vegetarian as the toppings you choose. Fruit: I’ve never done this myself, but I’ve heard you can grill things like peaches. I think the idea is that it caramelises the fruit sugars, which changes the taste entirely. I’ll get around to trying this one day. I hope that gives you a starting point to work from. If you have any favourite vegetarian grilling ideas that you’d like to share (please do), leave them in the comments below. Throw some corn on the barbecue, why don’t you? It’s roasty, toasty and tastes like the grill. What Safeway have you found the Schneiders Oh Naturel products at? I can’t seem to find them. Thanks! I can find them quite easily at Safeway stores in Calgary. They’re usually in the meat freezer section, next to the meat they’re replacing. I know for sure I’ve seen them at the Brentwood and Dalhousie Safeway locations. There appear to be fewer products in the line than there used to be, so don’t be surprised if you can’t find an old favourite. I tend to see “chicken” nuggets and breaded patties, as well as “beef” burgers and “meat” balls.